Let’s pattern it after David Letterman’s list though – a snazzy Top Ten! It could be a list of any top tens: ten reasons why I love you, ten special memories between us, ten outstanding character traits, ten goals achieved, ten reasons why you make me laugh, ten reasons why I call you friend, ten favorite activities you share, ten things you’ve said that changed my life. Again, the list goes on. Go old fashioned and simply write the list on a card or notebook paper and slip it somewhere they won’t expect to find it: a backpack, briefcase, lunchbox, dashboard, etc. Can’t think of ten things? No problem, a Top 8, or Top 5 list is just as good. The point is the same: letting someone know they are important to you! 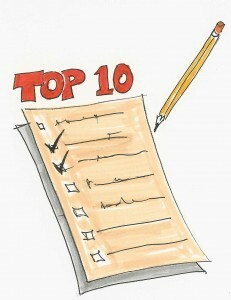 If you wrote a Top Ten List, what theme would it be? How would you present it? This entry was posted in Family Life, Friendship, gifts, Humor, Word Gifts, Writing on October 3, 2012 by aliciachall28. Posting in honor of a friend who wrote this for me and posted it as a notification on FB. How creative is that. I even left Cory a Top 10 Reasons why I love you list on the bathroom mirror when I went out of town last week. Now, he won’t let me erase it!